The 3rd century was the period from 201 to 300 A.D. or C.E. In this century, the Roman Empire saw a crisis, starting with the assassination of the Roman Emperor Severus Alexander in 235, plunging the empire into a period of economic troubles, barbarian incursions, political upheavals, civil wars, and the split of the Roman Empire through the Gallic Empire in the west and the Palmyrene Empire in the east, which all together threatened to destroy the Roman Empire in its entirety, but the reconquests of the seceded territories by Emperor Aurelian and the stabilization period under Emperor Diocletian due to the administrative strengthening of the empire caused an end to the crisis by 284. This crisis would also mark the beginning of Late Antiquity. In Persia, the Parthian Empire was succeeded by the Sassanid Empire in 224 after Ardashir I defeated and killed Artabanus V during the Battle of Hormozdgan. The Sassanids then went on to subjugate many of the western portions of the declining Kushan Empire. In China, the chaos that had been raging since 189 would ultimately continue to persist with the decisive defeat of Cao Cao at the Battle of Red Cliffs in 208, which would increasingly end the hopes of unification and lead to the tripartite division of China into three main empires; Shu, Wu, and Wei, colloquially known as the Three Kingdoms period, which started in 220 with the formal abdication of Emperor Xian of Han to Cao Cao's son, Cao Pi, thereby founding Wei, which would go on to conquer Shu in 263, but would ultimately be united again under the Jin dynasty, headed by the Sima clan, who would usurp Wei in 266, and conquer Wu in 280. In India, the Gupta Empire was on the rise towards the end of the century. Korea was ruled by the Three Kingdoms of Korea. Japan entered the Kofun period. The Xiongnu formed the Tiefu state under Liu Qubei. 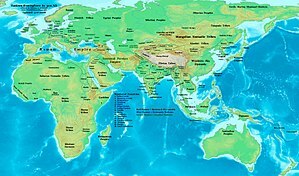 The Southeast Asian mainland was mostly dominated by Funan; the first kingdom of the Khmer people (Cambodians). At about this time in Sub-Saharan Africa, the Bantu expansion reached Southern Africa. In Pre-Columbian America, the Adena culture of the Ohio River valley declined in favor of the Hopewell culture. The Maya civilization entered its Classic Era. After the death of Commodus in the late previous century the Roman Empire was plunged into a civil war. When the dust settled, Septimius Severus emerged as emperor, establishing the Severan dynasty. Unlike previous emperors, he openly used the army to back his authority, and paid them well to do so. The regime he created is known as the Military Monarchy as a result. The system fell apart in the 230s, giving way to a fifty-year period known as the Military Anarchy or the Crisis of the Third Century, following the assassination of the 28-year-old emperor Severus Alexander (the last emperor of the Severan dynasty), where no fewer than twenty emperors held the reins of power, most for only a few months. The majority of these men were assassinated, or killed in battle, and the empire almost collapsed under the weight of the political upheaval, as well as the growing Persian threat in the east. Under its new Sassanid rulers, Persia had grown into a rival superpower, and the Romans would have to make drastic reforms in order to better prepare their state for a confrontation. These reforms were finally realized late in the century under the reign of Diocletian, one of them being to divide the empire into an eastern and western half, and have a separate ruler for each. Early 3rd century – Burial in catacombs becomes common place. 211 – 217: Caracalla, Roman Emperor. 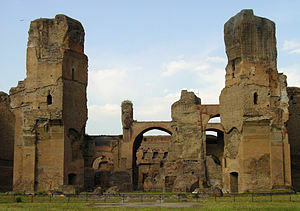 212 – 217: Baths of Caracalla. 220 – 280: The Three Kingdoms period. 222 – 235: Alexander Severus, Roman Emperor. 224: Ardashir I of the Sassanid dynasty conquers the Parthian empire at the Battle of Hormozdgān. 230 – 232: Sassanid dynasty of Persia launches a war to reconquer lost lands in the Roman east. 234: Zhuge Liang dies of illness at the standoff of Wuzhang Plains. 235 – 284: Crisis of the Third Century shakes Roman Empire. 244: Battle of Xingshi in China. 250 – 538: Kofun era, the first part of the Kofun period in Japan. 258: Valerian's massacre of Christians. 260: Roman Emperor Valerian I is taken captive by Shapur I of Persia. 263: Cao Wei conquers the Shu Han Kingdom. 266: The Jin Dynasty is founded after the overthrow of the Cao Wei Dynasty by Sima Yan. 280: The Jin Dynasty reunites China under one empire after the conquest of Eastern Wu. 284 – 305: Diocletian, Roman Emperor. 291 – 306: The War of the Eight Princes, a civil war by the Sima Clan in China. Sarnath becomes a center of Buddhist arts in India. Diffusion of maize as a food crop from Mexico into North America begins. The Kingdom of Funan reaches its zenith. The Goths move from Gothiscandza to Ukraine, giving birth to the Chernyakhov culture. Menorahs and Ark of the Covenant, wall painting in a Jewish catacomb, Villa Torlonia (Rome), are made. Siddhartha in the Palace, detail of a relief from Nagarjunakonda, Andhra Pradesh, India, is made (approximate date). Later Andhra period. The artwork is now kept at National Museum, New Delhi. Jonah Swallowed and Jonah Cast Up, two statuettes of a group from the eastern Mediterranean, probably Asia Minor, are made. Now kept at The Cleveland Museum of Art. The Magerius Mosaic is made. Late 3rd century-early 4th century – Good Shepherd, Orants and Story of Jonah, painted ceiling of the Catacombs of Marcellinus and Peter in Rome, is made. ^ McNab, Chris (2017). Famous Battles of the Ancient World. Cavendish Square Publishing, LLC. p. 74. ISBN 9781502632456. ^ "Han dynasty | Definition, Map, Culture, Art, & Facts". Encyclopedia Britannica. Retrieved 17 March 2019. ^ "Three Kingdoms | ancient kingdoms, China". Encyclopedia Britannica. Retrieved 17 March 2019. ^ Bomgardner, David L. (2013). The Story of the Roman Amphitheatre. Routledge. p. 211. ISBN 9781134707393.